The Mind of a Helmet Camera Cyclist: East Dunbartonshire. Time for Change. Today on Facebook I was reminded of a photo from 4 years ago. 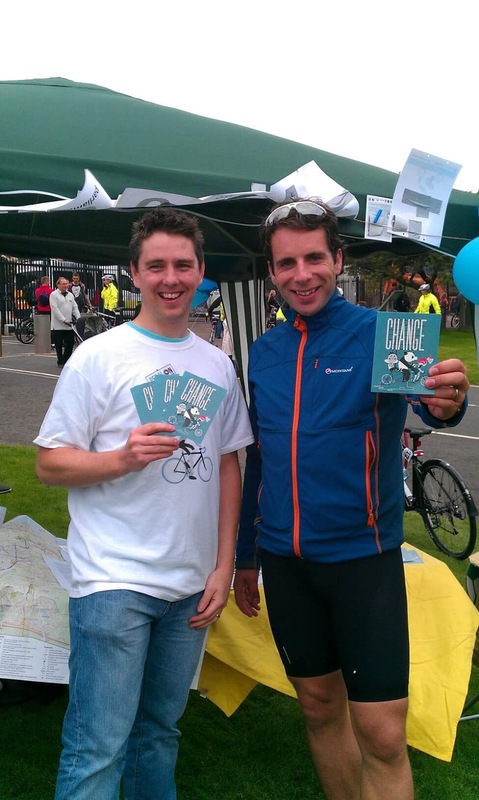 It was a photo of me with Mark Beaumont at the finish area of Pedal for Scotland handing out Pedal on Parliament postcards with the word Change on them. This was early days in the Pedal on Parliament campaign when we were still finding out feet, and wondering if Change could really happen. It was a time when pretty much every council was paying, at very best, lip service to cycling. You'd get the odd ASL here, the odd painted lane there. The change we were asking for was fundamental. We weren't just asking for change in funding for cycling, we were asking for a significant change in political will. So what Change have we seen. At first glance you might think very little. We haven't reached the 10% of funding for active travel (5% for cycling), that we asked for. Yes, funding has increased, but only a wee bit. It hasn't gone down, which is probably a victory! So we've failed? No. The Change that has occurred has been more subtle. When we started there were battles even within the cycling community. To segregate or not segregate, that was the question. There were still many who felt that the roads were fine, that paint would help, and that education would supplement the paint. There was a time that I thought that too. Thus places like London pressed on with the 'Superhighways' which consisted of blue paint. A nice shade of blue paint, granted, but it was still just paint. Did the revolution come? No. In fact the lack of proper facilities just angered people more. Worse, people were dying. Bikes and HGVs especially were mixing in a way that would only end one way. The superhighways had failed. And so, in London the bloggers, the press and the people who cared, pushed on. Political pressure was applied. Eventually it paid off and grand plans were announced. Fantastic! Except, not everyone was happy. Many were furious! There'd be bedlam. Traffic grid lock. Business would suffer. Why cater for a small minority?! There's no space! NO ONE WOULD USE IT!! Very politically difficult decisions had to be made. Amazingly they were. The anger didn't stop there. It got more vociferous. Angry celebrities in their chauffeur driven Rolls Royces talked of chaos. Businesses set about legally challenging the lanes. But the lanes went ahead despite it all. And then they were finished. What happened next was.....well, it wasn't chaos. It wasn't gridlock. It was something that previously many didn't believe possible. The lanes worked. People, not just Lycra clad warriors (I say that, having been labelled as one) or commuting die hards, came out to use them. It was people, all shapes, sizes and ages. Families are now seen cycling through central London. Not up the back roads, not on a canal path far away from sight, but on main commuter roads. It was and is a wonderful sight to behold. So now more lanes are planned, and again the doomsters are fighting it. It can't work!! Gridlock!! Etc. However, the arguments are sounding a little more hollow, and fly in the face of what many can now see for themselves. That people can and do want to move around a city in a different way. Back in leafy Bearsden and Milngavie, we can hear cries of....but we're a town, not a city. It's different here! These bare more than just a passing resemblence to the the cries from London, but we are a huge city, we aren't Amsterdam, it can't happen here. Example after example from Europe, from the US and beyond are now showing us that everywhere isn't different. People are people, cities are cities and towns are towns, and given the right conditions where cycling is provided as a safe and viable alternative, it does happen. It's not easy of course, because Change never is. It involves making some sacrifices. It means that a road might have to be a wee bit narrower. It means that occasionally you might have to wait behind a bus for 20 seconds. It means that occasionally at junctions, priorities might need to be adjusted. The odd parking space has to be lost! It feels like our liberties are being taken away from us. Are we truly free though? Is having a congestion free dual carriage way Bearsden Road which you can zoom down at 40 mph without impediment in your car really freedom? Only to be stuck in 2 miles of nose to tail traffic on the Switchback Road, which is already dual carriage way, so perhaps we need three lanes each way? What about those that can't drive, perhaps as they are too young, can't afford it, or are not able to through disability. Sure, the bus is one option, but it will never truly provide the freedom that we yearn, by taking us from where we live to where-ever we want to go. It will help to some extent, and is part of the integrated solution, but it is not the whole answer. Freedom only comes when all those who wish to travel, by whatever means they wish, can do it in a way that is safe, comfortable and convinient. As London, and countless other examples demonstrate, if you build it, they will truly come. And they will come with the many, many benefits that having a significant percentage of your populations travelling actively will bring. So I call on the politicians and especially the councillors of East Dunbartonshire to think carefully about the future. Not just their own future, or at the ballot box next year, but for the future of an area I am sure they really do care for. I ask for them to consider that Change, even politically difficult Change is not only desirable, but needed for the area to flourish. Yes there is a strong local voice against it, but then many of them don't want children to have freedom of safe movement. Is that what you and your party stand for?! Really? If they chose not to invest in active travel, the area will drown under the weight of the motor vehicle, something that even many of the opponents of the Bears Way agree is an issue. The status quo, or returning the road back, 'to its former glory' is simply not the answer. Be on the side of change. Be on the side of a brighter, healthier, less polluted, less congested East Dunbartonshire. Be on the side of Change for a better future. An active travel East Dunbartonshire. A great, positive, optimistic article. I do hope it has the desired effect.